Preheat oven to 350°. 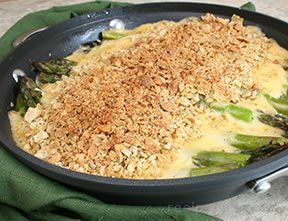 Place the above ingredients in a 9 x 9 or 10 x 10 baking dish in the order listed and leave the crushed crackers to add later. Bake on 350° for 25 minutes. Remove from oven and spread crackers over top of casserole. Return to oven until cracker topping is golden brown. 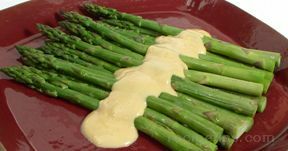 For a larger casserole use a 13 x 10 dish and add a second can of asparagus extra long spears, a second can of sweet peas and a second can of cream of mushroom soup. Always save the crushed crackers for the topping.